This week’s action got underway Friday in DENVER where the MAMMOTH earned a hard fought home win over VANCOUVER. The STEALTH have shown some improvement the last couple weeks, but remain with only one win. JASON NOBLE (3g, 5a) hit a couple of clutch shots down the stretch to lead the MAMMOTH. Once again VANCOUVER was without LOGAN SCHUSS ... COREY SMALL (4g, 5a) seems to be getting back up to speed after a very slow start. It was his third hat trick in a row. ERIC PENNY played well in goal for the STEALTH, making 32 saves. I would imagine he has taken control of the goal crease for the STEALTH. JOEY CAPIDO may be the fastest player in the NLL this season, he created a ton of transition opportunities for the MAMMOTH while putting up 1g, 2a and 8 LBs. There was a lot of chatter about the commentating from some of the games last week. But let’s give some love to the MAMMOTH broadcast team. TEDDY JENNER and JOHN GALLANT were joined by the legend ... JOHN GRANT JR. He was positioned between the benches and gave some great insights throughout the broadcast. It was a TOM SCHREIBER tsunami in TORONTO and it crashed on the BLACKWOLVES to the tune of 5g, 7a. ROB HELLYER was also a force on the right side with 4g, 5a. ADAM JONES remained on fire from the left side with 5g, 4a. Captain America added to his highlight reel as a couple of the goals were amazing shots. This guy has the best release in the game! He will be making a big push for MVP this season, you heard it here first. NICK ROSE may have had his best game of the season and made 46 stops. Many of them were highlight saves. KEVIN CROWLEY, STEPHAN LEBLANC and DAVID BROCK had two goals apiece. SHAWN EVANS was held goalless, he did have 3a though. Overall a poor shooting night as they shot 11% as a team. The BLACKWOLF defense seemed a step slow all night long. BOLD wasn’t sharp either as he was replaced by DOUG JAMIESON in the 2nd half. Speaking of the 2nd half, the ROCK outscored NEW ENGLAND, 11-2 and 7-0 in the 4th. This season the BLACKWOLVES have held the opposition below 10 goals 3 times. But, they have given up over 20 twice now, both on the road. They lost 23-11 versus the RUSH in SASK earlier in the year. The BLACKWOLVES will be happy to return to MOHEGAN SUN February 9 against BUFFALO in another huge East Division game after a bye week. TORONTO will be home next weekend versus CALGARY, the ROCK have scored 82 goals over the last 4 games! BEN MCINTOSH (2g, 2a) scored in OT to win it for the RUSH. For the second week in a row they blew a large lead. They started the 3rd up 10-4. But like last week let the opponent back into the game as CALGARY scored 7 of the next 8 goals. JEREMY THOMPSON had another strong game with 1g, 1a, 8 LBs while going 14 / 25 on faceoffs. ADRIAN SORCHETTI chipped-in with 2g, 1a & 5 LBs. I only saw the latter stages of the game, but there were some positives for the ROUGHNECKS. Going into this week CURTIS DICKSON wasn’t even in the top 20 for points in the NLL. But, he came out and played his best game of the season with 5g, 1a. That has to make the CALGARY staff feel better. CHRISTIAN DELBIANCO may have had his best appearance of his young career making 29 saves in relief. DANE DOBBIE (2g, 5a) became the ROUGHNECK all time leading scorer in the game. Bring his career total to 343g, 346a for 689pts, all with CALGARY. Congrats to DANE! They will be in a battle all season long with VANCOUVER for the final playoff spot. They had a great crowd on STAR WARS NIGHT with an announced attendance of 11,196. The SWARM used a 6-0 run in the 2nd half to seal the win. Looked to me VANCOUVER may have been feeling the effects of back to back games as GEORGIA had some transition opportunites. JEROME THOMPSON, FRANK BROWN & JOHN RANAGAN all had transition goals during the run. RANDY STAATS was also very active shooting 4/17 and adding an assist. He also got into a fight with CHRIS O’DOUGHERTY. He showed he can throw punches and put up the points, well done! THE POULIN WALL was in full effect as he made 33 saves on the night. LOGAN SCHUSS (3G, 5A) and JOEL MCCREADY (3G, 2A) both were back in the VANCOUVER lineup after missing Friday’s game in COLORADO. McCREADY served a suspension, while SCHUSS on did not report list for the second time this year. MCCREADY has shown an impressive power game from the right side. THE STEALTH are beginning to show some signs of life. But they remain in the basement with CALGARY as both have one win each. Went 3-1 for the week ... stands at 19-8 for the season. 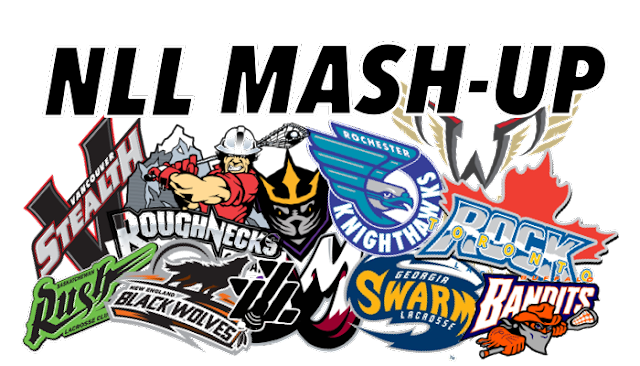 In last weeks Mash-Up we said the ROCK would win the East, but we were picking with our hearts this week choosing the BLACKWOLVES for this weeks game, that was our only loss this week.